Open water swimming in the sea or in a lake holds huge appeal to many swimmers; there is more space, the view is better, and the variety of conditions can offer a challenge and sense of achievement that can’t be found in a pool. It is so much more than just exercise, but it is great exercise nonetheless. 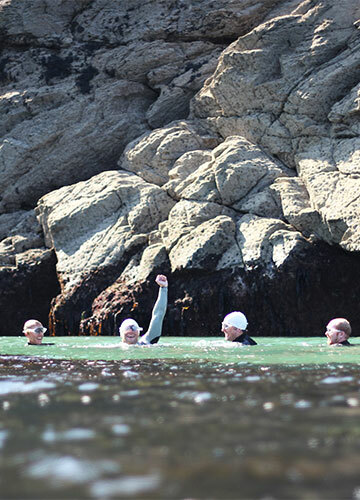 Join a guided group swim, book a private group or 1:1 swim, or come along to an open training session, and experience the beauty of the Cornish coastline whilst improving your open water technique. Whether you’re a triathlete in training or you’ve never left the pool, we have options for all abilities. 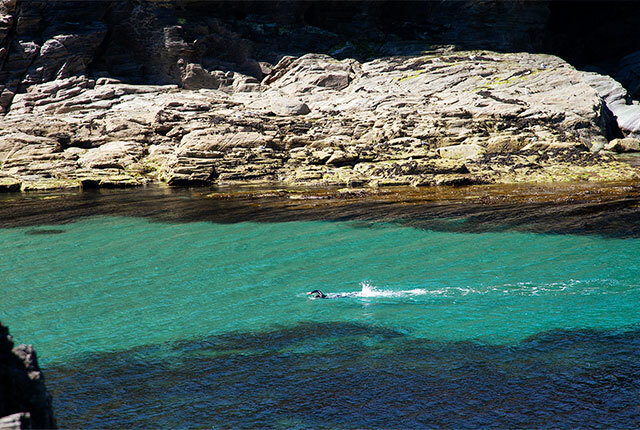 Our guided group or private swims are designed to cater for those swimmers wanting to explore beyond the confines of the bays and experience swimming sections of otherwise inaccessible coastline, either with other like-minded swimmers or in a private (group or 1:1) situation with a more specific aim such as coaching or a completing a particular distance or route. During our guided group swims you can expect to cover between 1.5 – 2 km (please see physical requirements below for level of ability required), swum at the pace of the slowest swimmer and with regular breaks to re-group, chat and take in the stunning scenery. 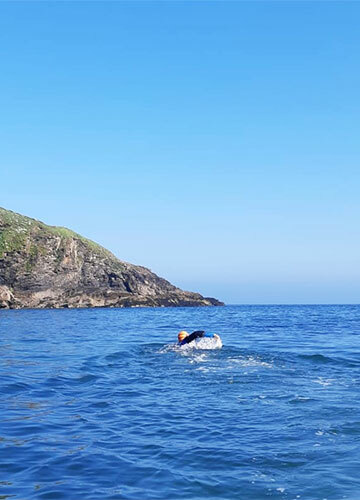 Private group or 1:1 guided swim sessions are completely bespoke, and it doesn’t matter whether you are new to open water swimming or an experienced athlete training for an event. As such, distances and pace can be whatever you desire and we will plan the route to suit your individual needs. Private sessions can be purely guided, purely coached, or a mixture of both. All our guided swims begin with a discussion about conditions, safety and route options, followed by a short acclimatisation, a warm-up lap and then we’ll be on our way. You will be led by a qualified open water swim coach and lifeguard who will swim or paddle alongside you, providing support, encouragement, navigation and will carry anything you may need during the swim. Allow two hours for the session, including 30 minutes for changing and briefing. 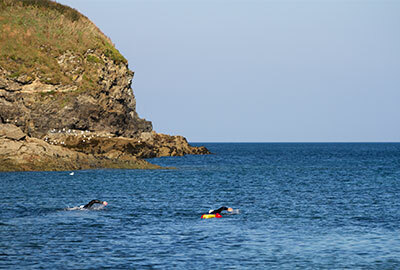 We aim to run swims from our base at Port Gaverne if conditions allow. 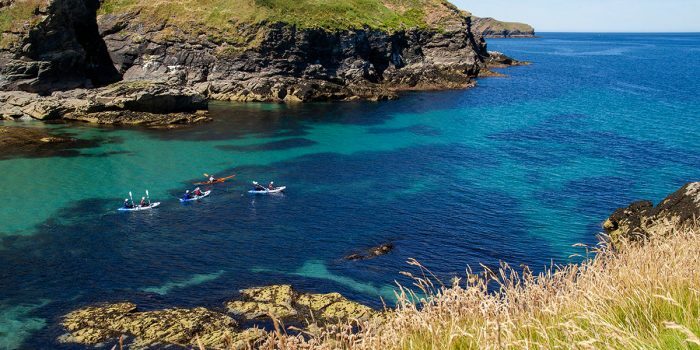 Should weather or sea state prevent us swimming from Port Gaverne, we have a number of other stunning venues (Daymer Bay, New Polzeath, Lundy Bay & Port Quin) available to us within 10 mins which we may also use. We will contact you at least 24 hours in advance to confirm the venue. 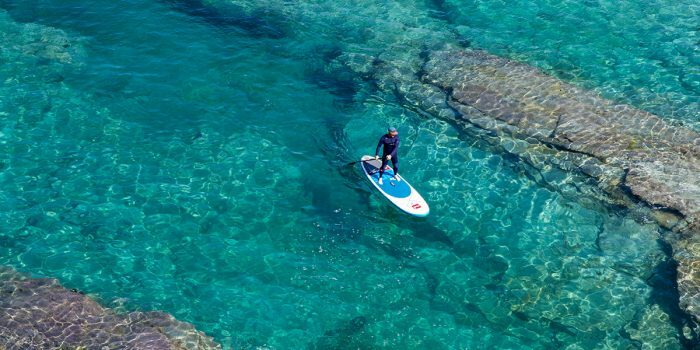 Alternatively, if you want to set your own challenge or have a desire to swim a particular section of the nearby coastline then we can plan this with you and wait for the right conditions. Guided group swims costs £30 per person. 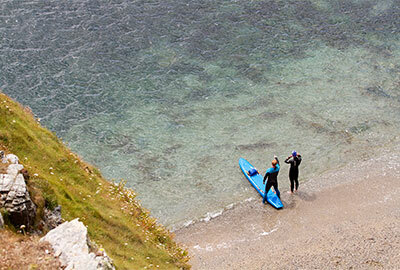 Private guided swims or coaching sessions cost £50 for the 1st person and £25 for each subsequent member of the group. Participants in group swims must be able to swim 400m unaided in less than 12 minutes and have some experience of swimming in open water. Participants in private swims must be able to swim 25m unaided. Equipment can be provided – all you need to bring is a towel and swimwear. Our weekly, one hour long open-to-all training sessions are great for anybody wanting to swim in nature or train in an environment and make improvements specific to their goals. These structured sessions use a looped course and focus on both fitness and skills development. Making improvements in your swimming ability need not be confined to the black line in the pool, and if your aims involve open water swimming then the swimming indoors has its limitations; these sessions allow you to swap a pool session for a structured open water training swim. The venue may vary slightly to accommodate weather and tidal conditions, with looped courses that allow swimmers of all abilities to take part. 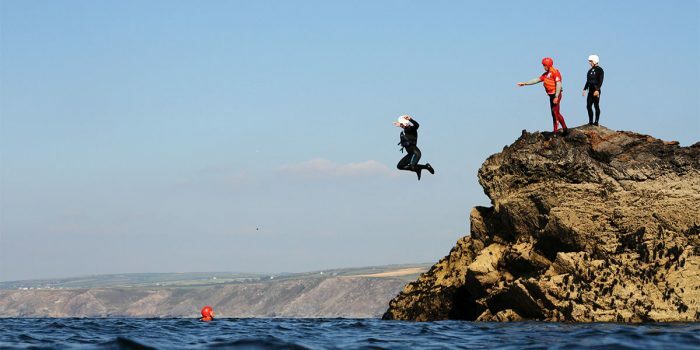 Besides having a focus on fitness, each session will incorporate open water specific skills such as drafting, sighting, navigating buoys and negotiating beach entry/exit to improve technique and confidence in the open water. 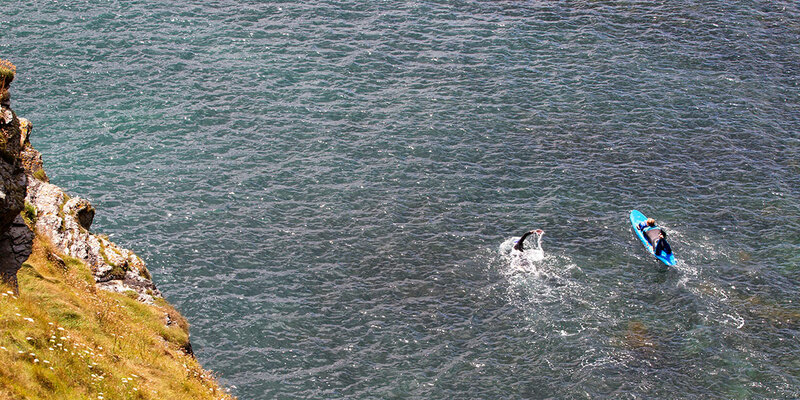 Open Water Swim Training Sessions cost £8 per person. Booking is essential. Training swim venues will be confirmed 24 hours in advance on social media, and by e-mail and phone. Participants in open water swim training sessions must be able to swim 400m unaided in less than 12 minutes and have some experience of swimming in open water. We offer a range of options, from joining a group swim to 1:1 private coaching sessions.